In a time when a fishery’s appeal is largely determined by the size of the fish it stocks, the idea of a small book about even smaller fish is an appealing one – the more so after I recently spent a happy day catching roach and perch, none of which would have tipped the scales at half a pound. The post-war specimen movement might have taught us a lot about how to catch big fish, but in the process it has denied more than a few anglers the ability to appreciate the fun of their smaller cousins, which are just as remarkable. This is out of the line of the usual ‘description/habits/how-to-catch shedloads of ‘em’ fishing manual, in as much as there isn’t very much about how to outwit the wily minnow, but Mark Everard writes entertainingly and he does much to highlight the vital niches that small species fill, sat as they are at the base of the food chain. So here is a book about bullheads, loaches, sticklebacks, lampreys, ruffe, gudgeon and their kin, by an author who is an aquatic biologist in addition to being a fisherman and who breathes life and interest into species that many anglers regard as pests. As a package it takes some beating and the book feels good in the hand. 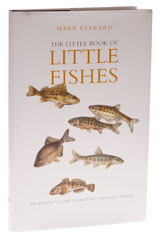 Raise a glass to small fish and buy this – it is a real one-off and a good read.